Good Morning, welcome to another episode of #ThatBusinessShow, #WorkingWomenWednesday Edition! Every Wednesday, we have in guests from the Working Women of Tampa Bay Group, who come in to tell us about what they are doing for the community, and how the group has benefited them! The Working Women of Tampa Bay Group brings women together in our community, to share business and support each other as they work to do everything from setting up charities, to working for equality in the workplace. Our two guests from the Group were Debbie Cox Roush and Kim Randall! Debbie is the owner of DCR Creative Solutions of Florida, working to bring more women into leadership positions, and to work for equality under the law! 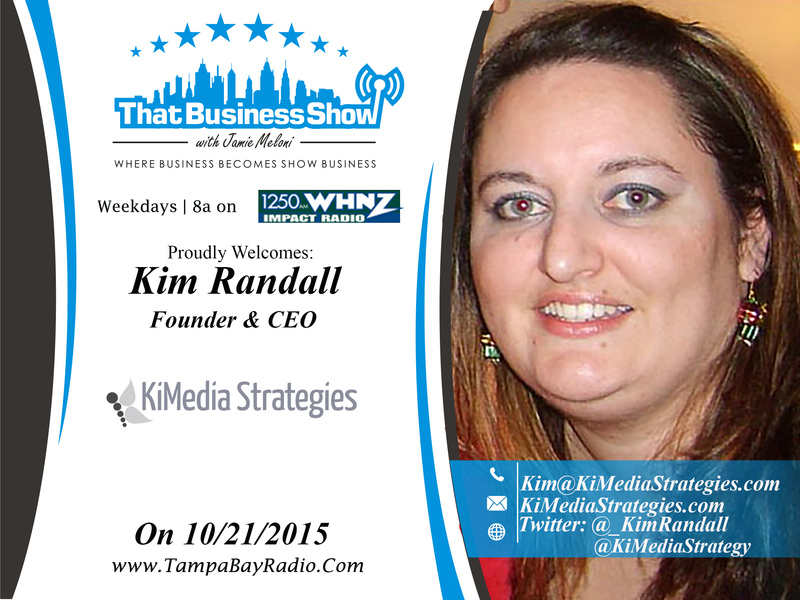 Our next guest was Kim Randall, Founder and CEO of KiMedia Strategies! If you missed today’s episode of #ThatBusinessShow on #WorkingWomenWednesday, then head to http://www.tampabayradio.com or head to Jamie’s YouTube Channel at http://www.youtube.com/jamiemeloni! 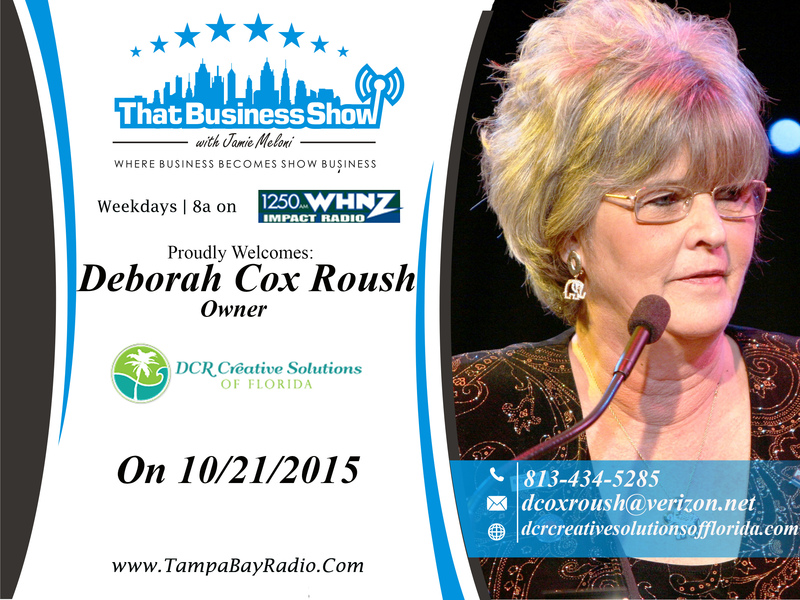 On the first segment of #ThatBusinessShow #Workingwomenwednesdays edition, we welcomed Deborah Cox Roush, Owner of DCR Creative Solutions of Florida. As an advocacy consulting and event Management Company, DCR provides dynamic strategy, organization and management for advocacy issues, political campaigns, and corporate events as well as complete onsite management. Deborah is committed to helping women break through the political world that is mostly dominated by men. Through education and grouping, Deborah is raising awareness on huge issues that affect women regularly like pay inequality, and representation inequality. Debbie was speaking to our listeners about how even in the 21st century, women are being paid seventy cents to a man’s dollar, despite also holding the majority of the population in the United States. With the Working Women of Tampa bay Group, Debbie has been working to educate the members of the group and advocate for more women to take the reigns in the political scheme! To learn more about Debbie Cox Roush and DCR Creative Solutions of Florida, head to http://www.dcrcreativesolutionsofflorida.com! On the next segment of #ThatBusinessShow, our Host, Jamie Meloni welcomed Kim Randall, Social Brand Strategist, TEDx speaker, blogger, and passionate entrepreneur. Kim currently serves as co-chair for Beer & Bow Ties, a fundraising event to benefit the Crisis Center of Tampa Bay, and serves on the board of advisors for HCC’s entrepreneurship program. You may recognize the entrepeneurer program from HCC becuase we had the leader, Andrew Gold, on #ThatBusinessShow earlier this week! On the #MorningAir, she was telling us of how she started her passion of entrepreneurship, and how she is impacting our community today by helping young entrepreneurs gain the knowledge they need to possibly succeed! To learn more about Kim and her endeavors in social media, head to KiMedia Strategies at http://www.kimediastrategies.com! This entry was posted in Articles, Entrepreneurship and Business and tagged business, radio, talk, working women of tampa bay. Bookmark the permalink.